The three most commonly used MANET routing protocols are DSDV, AODV and OLSR. The following benchmarks compare these protocols to the OrderOne Networks Mesh Network Routing Protocol at network sizes between 50 and 300 nodes. Network density is constant as the network size varies between 50 and 300 nodes. A moderate to high network load is provided by 80 constant bitrate (CBR) data flows. The simulator was ns2 v2.34. The AODV and DSDV protocols were provided with ns2 and the OLSR protocol was UM-OLSR 0.8.8. These are the most recent versions available and are configured using their default parameters. Delivery ratio, latency and control bandwidth overhead for each of these protocols at different network sizes were gathered. 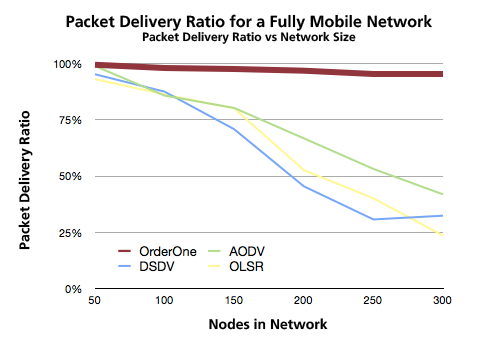 The OrderOne Networks Mesh Network Routing Protocol is able to maintain a high packet delivery ratio as the network size increases.The OrderOne Networks Mesh Network Routing Protocol is almost unaffected by network size. 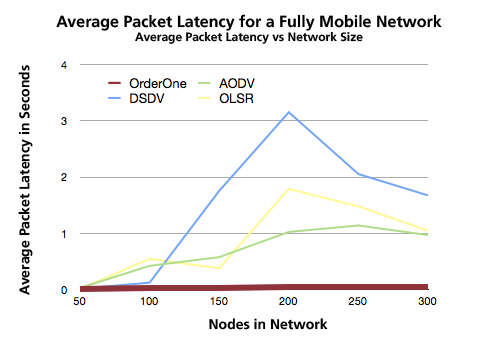 Packet latency is extremely important when a network is moving voice or video data. 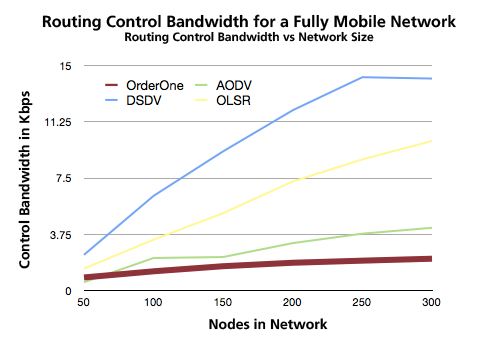 Regardless of network size the OrderOne Networks Mesh Network Routing Protocol finds the best route to minimize latency. Control bandwidth for the other routing protocols can grow exponentially with network size. In these sets of tests the OrderOne Networks Mesh Network Routing Protocol control bandwidth was configured to never exceed 2.12Kbps. At the smaller network sizes even this modest allocation was not required. The OrderOne Networks Mesh Network Routing Protocol clearly outperforms these other available routing protocols. A cost free evaluation license is available to allow potential licensees the ability to perform their own analysis.